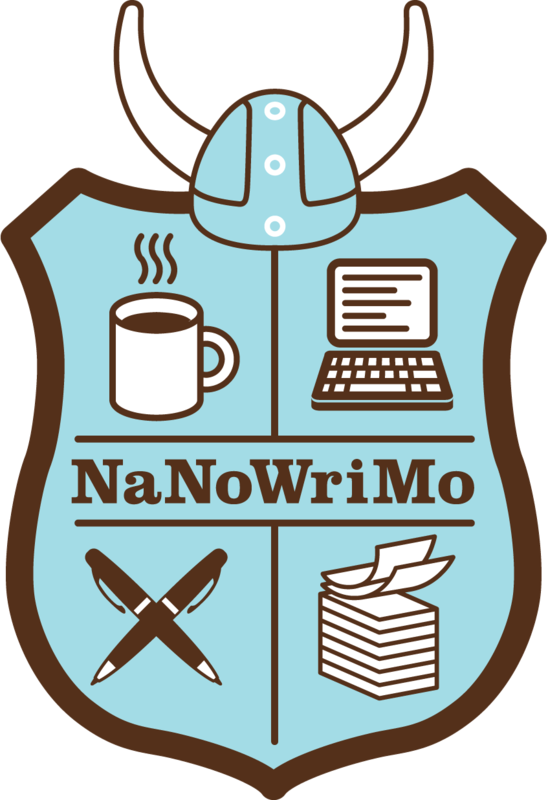 Today’s post was written by Kristi Drillien as we stand upon the brink of the splendid, terrifying adventure known as NaNoWriMo. (I’m too busy for NaNoWriMo this year, but… someday, maybe.) Take it away, Kristi! Have you ever had a story to tell, but didn’t know how to tell it? Ever thought about writing a book, but didn’t think you could? Ever just wanted to write for fun, but couldn’t really find the time, motivation or reason to do it? If your answer to any of these is yes—or even if it’s not—let me tell you about NaNoWriMo. NaNoWriMo is a yearly event taking place in November in which participants attempt to write a novel in thirty days. Sounds scary, right? Fortunately, there’s a lot more to it, so I’m going to share some of the finer points of NaNoWriMo. Let me start by saying that yes, 50,000 words sounds like a lot. And it is a lot. (It’s closer to a novella than a novel, though). Fortunately, participants have thirty days to reach that goal. If you do the math, that works out to 1666.66667 words per day, which doesn’t sound so scary (unless you try to figure out how to write 0.66667 of a word). It takes commitment, but it is definitely possible. Ask the 300,000 people who participated last year! NaNoWriMo is all about quantity, not quality. One of the biggest keys to succeeding at NaNo is not to edit. You are not writing a wonderful novel to share with friends or submit to publishers… at least, not right away. December is for editing. November is for writing. If you give into the urge to go back and fix what you have written, you likely won’t finish. I met someone earlier this year who declared he could never participate in NaNoWriMo because he didn’t see the point of writing all month expecting to produce a bad manuscript. I suppose he makes a fair point. But unless you already write on a regular basis, churning out a novel that isn’t very good is better than doing nothing. Most people who do NaNo are doing it just for fun and for the challenge. One of the biggest elements of NaNoWrimo is the social aspect. When you sign up on the website, you can find your home region, where you will almost definitely find in-person events going on during (and even a bit before and after) November. You may be surprised to find so many people living in your area who are also crazy enough to do this. It can be incredibly helpful to have that system of support. There is also a huge community on the forums you can be part of. If you think you can’t participate because you don’t have time, don’t have ideas or simply aren’t ready, there are many people who are or have been in the same situation as you. They are always willing to share tips, ideas and suggestions or just share your agony. You can find forums specific to your genre or age group, and forums where people can go to get help with plot, characters or help coming up with a title. Something I’ve never tried but may try this year is a word war. In a word war, two or more people set a time limit and write as many words as they can in that time. Whoever writes the most wins. It can be a great way to push yourself to write without thinking too hard or hesitating (and definitely without editing). Writing 50,000 words in thirty days is a challenge. It really is. Many people do not finish. However, failure is not the end of the world. You may just find that you’re proud of what you’ve done, even if it wasn’t the full 50K. And if you do reach that goal, you can be truly amazed that you accomplished the impossible—writing a novel in thirty days. And if 50,000 words is not enough of a challenge, you can join the crazy people in the “Beyond 50K” forum, where they discuss things like writing 100K or even 150K in one month… or writing 50K in one day. NaNoWriMo begins today! For more information, check out the official site. This entry was posted in Writing and tagged creative writing, guest post by Adam Stück. Bookmark the permalink. I figured out how to write 0.66667 of a word – it’s not so ba . I’ll leave the other 1666 to other people. Nice post. Thanks, Kristi! I’m using NaNoWriMo to finish a non-fiction memoir that I’ve had sitting around for a while, and have been very passionate about but have found myself stuck at 15,000 words…So here I am at day 6, and I’ve added 5,000 or so. Good, for me! good luck! Here’s the first chapter of my book – 26 Kitchens: How Neither Here Nor There Became Home….